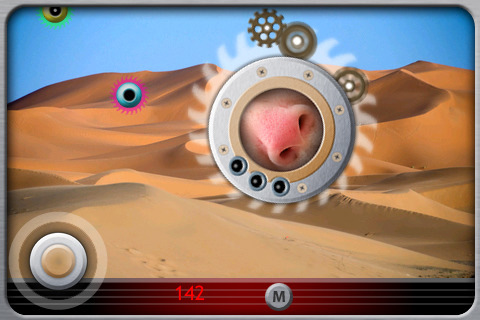 Easily one of the stranger games I’ve ever played, Nesen Probe falls squarely into Camp Weird. You play as a flying spaceship in the shape of a human nose. As you drift around the screen, the constant sound of creeping breathing follows as you’re hypnotized by the gently flaring nostrils. In addition to the giant space-nose, there are also a number of smaller orbs zipping about. Your goal is to inhale as many of these little spheres as possible, but taking care to avoid the gray ones. The green and purple spheres add to your high score, but the gray ones take away points and life. There is also the odd health sphere to help keep up your nasal well-being. The creeping breathing I mentioned is actually a key part of the gameplay, as you must time your movements so as to inhale desirable spheres while exhaling to repel undesirable ones. So…it’s basically carefully controlled space snorting. That’s really all there is to the game. Snort spheres and rack up a high score. You can change the environment you’re zooming around in, but it’s a purely cosmetic feature that has no effect on gameplay. I did, however, appreciate that the nose became red when in the snowy landscape. Still, the game could use a lot more content than just changing up the backgrounds. Although the actual game mechanics are decent, the game becomes repetitive very quickly. Although the space nose is clearly the product of a twisted and creative mind, the rest is just bland. I expected equally interesting rewards and enemies, or at least some more dynamic interactive action than the score counter ticking up. Worse still, while there are no goals other than chasing a high score, there are also no social aspects to the game, so you are only ever competing against yourself. This is baffling to me, since this is absolutely the kind of game that requires some kind of OpenFeint or Game Center integration, and its lack of an online leaderboard system is just crippling. 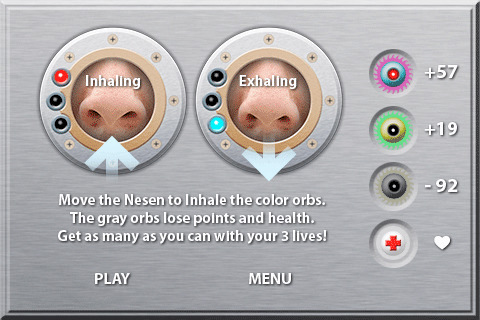 Overall, I found Nesen Probe to be disappointing, mostly for not living up to its wacky potential. The initial premise is one of the most original I have encountered, and the interface and mechanics are reasonably solid, but the game itself feels empty and underdeveloped, and the lack of social elements is almost unforgivable. If your game is about a flying, snorting nose-spaceship, then for heaven’s sake, do everything in your power to keep that threshold of weird as high as you possibly can, because the last thing you want is for your gonzo premise to suddenly become boring. AppSafari review of Nesen Probe was written by Tracy Yonemoto on October 28th, 2010 and categorized under Action, App Store, Games, iPad apps. Page viewed 2568 times, 1 so far today. Need help on using these apps? Please read the Help Page.